After 13 seasons as head football coach, Danny Palmer has stepped down and will be reassigned within the program. Palmer had much success as the head coach, so filling his shoes will be tough. He is well known in East Texas, especially Tyler. Palmer will still work with TJC athletics, but he will be more involved in the recruiting process. After two weeks of searching for the right head coach, interim Athletic Director Chuck Smith announced in a press conference that current defensive coordinator Thomas Rocco would be named the new head coach. Rocco has been with TJC since January 2017. Prior to joining the TJC staff, he spent two years at West Texas A&M as the defensive coordinator. His first coaching job was his alma mater, Fort Lewis College. Rocco also played football in college but sustained an injury which ended his career. After the injury, he began to help the coaching staff. “I coached some players that were older than me,” said Rocco. While he was at Fort Lewis they set a school record in wins. When Rocco was asked if his original plan was to coach he said, “no idea. I got a degree in education, but got hurt and couldn’t play”. As far as team goals Rocco has a plan. “For the players to maintain a 2.85 GPA, win the highway 31 games which are the Kilgore and Trinity Valley [CC] games, and of course win [all of] Texas,” said Rocco. Rocco has goals for himself as well, “ I want to win a championship, and have players leave on scholarship,” said Rocco. He teaches his team to be disciplined in all areas on and off the field. He wants his team to be involved in the community and on campus. Rocco is looking forward to making a good impression and enjoys interacting with people. Though TJC is coming off a 4-5 (3-4) record, the Apaches are hopeful to improve the record in the upcoming season led by new Head Coach Thomas Rocco. Congratulations Coach, good luck on your new endeavor! 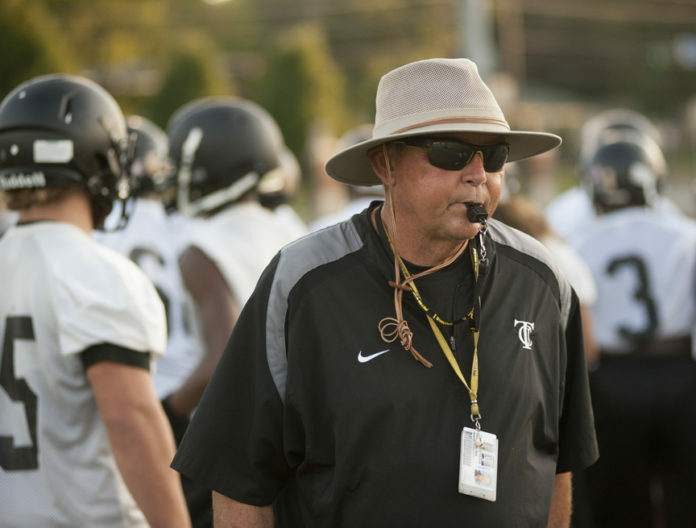 It is very sad to see that coach Palmer will not be returning as the head coach of TJC Football next year. Hopefully the next coach will be able to maintain that success that TJC holds and will even improve the program in the near future. So excited to see where the new coach will be taking things.